Don’t talk turkey - shoot it with these 12 gauge 3 inch magnum turkey shells from Winchester, the oldest name in ammunition! Turkey hunting is notoriously difficult, requiring ammo that patterns tight out of a shotgun and delivers serious power downrange. 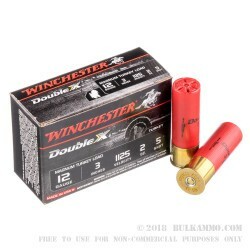 These 12 gauge magnum rounds from Winchester answer that call, with two ounces of #5 shot packed into a 3 inch package. They are an excellent choice for that next big turkey hunt. 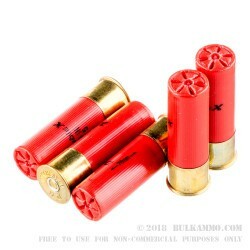 At 3 inches, these magnum 12 gauge rounds will pack quite a punch at over 1100 feet per second in velocity. 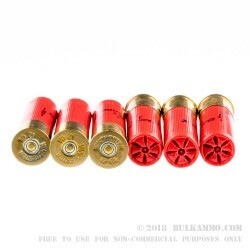 The #5 shot is packed with granular plastic buffer material that will keep the pellets from striking one another and deforming when they’re exiting the barrel. Shot patterns are held tight at turkey ranges thanks to the plastic buffer material and the copper plating over each individual piece of lead shot. 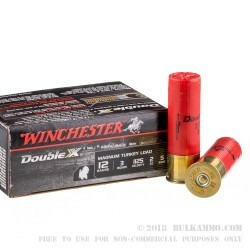 These 12 gauge shells from Winchester are packed in boxes of 10 instead of the usual 5, so shooters can focus more on getting those Toms instead of having to worry if they brought enough ammo with them.